Today’s guest writer is Brendan Parsons, one of the free-thinkers of the rookies I train and play with, and a Facebook star. I knew if he wrote for this blog, it would be more than worth reading, and I was right. Thanks, Brendan. It’s a mid-Thursday morning in October at the Icehouse, the rink is empty save for two figure skaters lazily carving spirals on the centre circle. A scruffy guy in his late twenties steps onto the ice, his legs seem to be bitching about the lack of sleep evident on his face, be he acts like he’s here to work. A few tightened laces later a younger guy joins him; similar, but skinnier, fresher looking and with some unscuffed Reebok skates. After a few cold-laps, they start skating together and chatting. They start to break into the familiar call and repeat dance steps that those of us without toe picks recognise. One semi-steady Mohawk turn, echoed by a fainter one in reply. An outside-edge glide turn, closely followed by an outside edge fall. Both attempt to shoot-the-duck, but no one is filling their pot tonight. After a few more laps they’re chatting again, now arguing the difference between Shona’s explanation of crossover vs Scuba’s explanation of crossovers; the guys are in different hockey school classes – Shona and Scuba don’t teach together. You could tell that the weight transfer in these moves was a long debated topic. You can hear that the older one is between jobs and icing his free days, while the younger just graduated uni and is killing time before he heads overseas. You can also hear the tension in the discussion. Brendan Parsons in action for the Tigersharks. The younger one abruptly disengages from the conversation and peels off in skating’s equivalent of a huff; a slow glide turn against the rotation of the Burberry rink. From this faintly competitive exchange, it’s clear that they are brothers. People with brothers recognize this interaction well – me especially, because I’m the older one. If I’m being kind, I couldn’t explain why I didn’t tell him – he loves watching NHL, went to games in the US and was complaining of being bored with soccer and futbol – but if I’m being honest I know exactly why I didn’t tell him. For the first time in my life, I was actually not completely useless at a sport. The years of doing weekly ‘sport-ed’ in high school led me to believe that I hated sports. Sport-ed was an internment class for people not chosen for interschool matches, but who were legally obligated to be detained during school hours. This often involved diversionary sports like going to the gym, bowling, playing t-ball (we were not capable of baseball) or sometimes just sitting in the sun (think Bad News Bears crossed with the Breakfast Club). Now I see that what I hated was not sport, but the sports on offer; cricket (four hours after school, not thanks), football (no chance unless you started in utero), tennis & table tennis (all that bending to get missed balls was a pain in the abs), and field hockey (I was, and remain, a dangerous menace with a stick which spent little time in my hands). 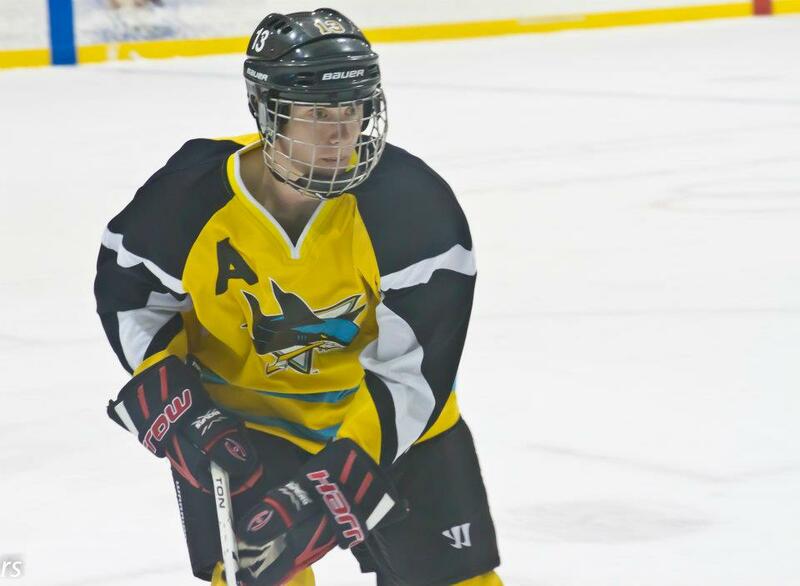 I had always wanted to try hockey, and about once a year I would Google it at work, send an e-mail, make a phone call and get zilch, until I remembered it a year later and repeated the fruitless endeavor. Then Icehouse opened. They said “Sure! But our next beginner class starts in 9 months.” I waited. I pined. I dreamt. 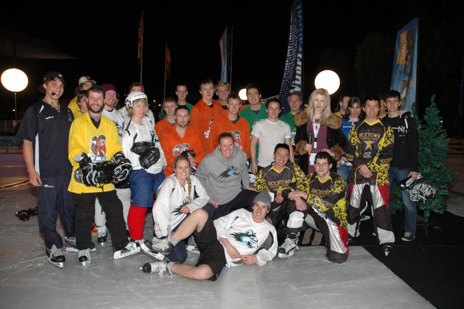 Us in last year’s Ice Blitz at the Winter festival (me, centre in orange, Aric to the left in orange) also, Dan Dixon, Todd Harbor, Will Ong, Emma Poyton, Chris Lourie) – this is where I first met all these people who are now all close hockey associates. I picked up ice hockey quickly. It utilised my natural skills; balance, agility, and predicting elastic collision trajectories. I was also easily distracted in other sports when balls would go out-of-bounds, so it was perfect. Moreover, I was meeting new people, keeping fit and having fun. The last thing I needed was my kid brother hanging around eclipsing my meagre progress. I just wanted a sport of my own. Our sibling rivalry did get me thinking though; is sibling rivalry sometimes a good thing? Would the Sedin twins be as quick if they weren’t racing each other? Would Gretsky have practiced 4-5 hours a day in his backyard rink if his brothers weren’t his lines-mates? Have the Wong brothers made each other what they are, for the Ice? Would Joey Hughes have started playing if he hadn’t seen his brother score a goal after watching the Mighty Ducks (this possibly apocryphal account comes via the internet – seeking conformation)? Perhaps not. I am starting to believe that hockey isn’t just a game; it’s a lifestyle, a family. And since my brother is skating on distant ice rinks from Iran to Kiev, I have actually missed the time we spent together skating. I don’t regret starting hockey on my own, but one day I may. I’m thankful that he had the tenacity to follow me and is now here so we can share this sport as friends. If we do play on a team together in the future (with jerseys broadcasting A.Parsons and B.Parsons), I hope that we continue to push each other forward and when he comes back, we continue skating together. Now when people meet the two of us, they no longer say he’s the sporty one, or that I’m the intellectual one, they comment on how similar we are and how committed we are to our common, unreasonable obsession. And despite him hating all my hockey-related posts on Facebook, he even said I could use his skates while he’s away. Now that’s brotherly love. This blog post goes out to all the hockey siblings; the Daws, the McNabs, the Places, the Houghs, and any others whom I’m yet to meet.